It may not be pretty, but no meal has excited me more in recent memory than the one I ate a few months back at Jeepney, the sibling of fellow East Village Filipino restaurant Maharlika. 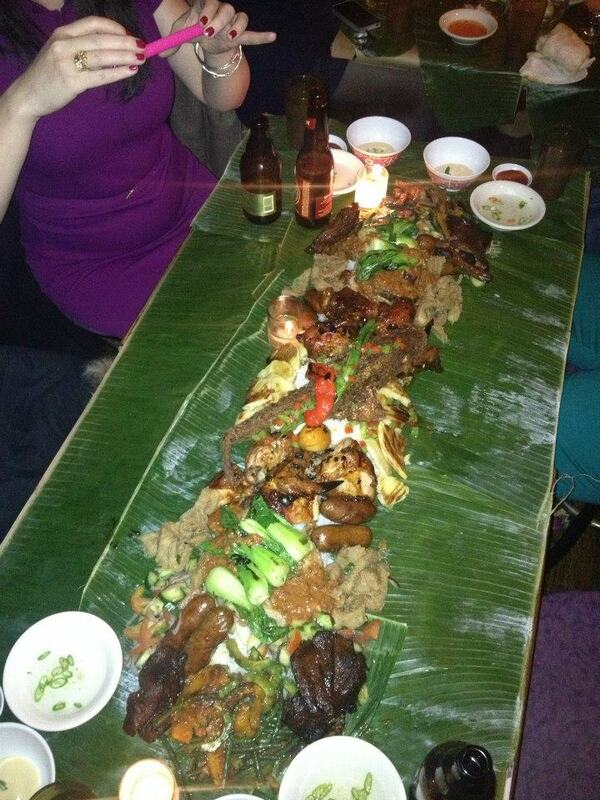 A huge plank of sticky rice was laid end-to-end over neighboring two-person tables covered in banana leaf. Our server carefully placed a whole fried fish in the center of the long white mound of coconut milk-flavored rice. 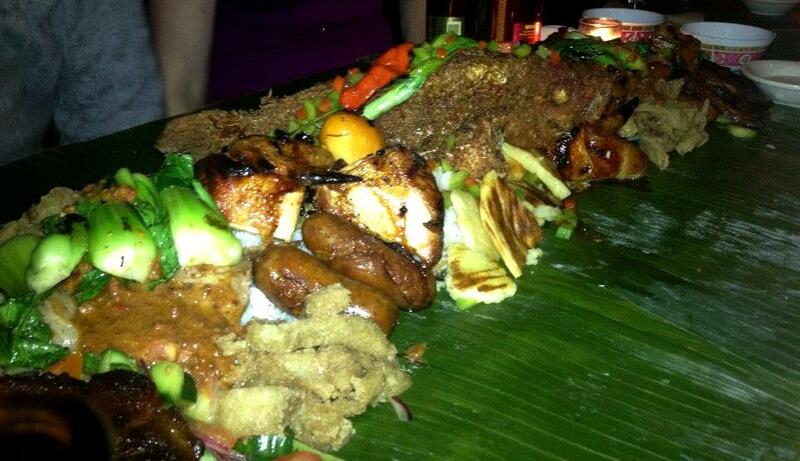 Spreading out from both sides of the fish, he symmetrically placed chicken, smoked soft boiled eggs, two kinds of pork (one in a coconut milk gravy, one marinated in Coca-Cola), sweet longanisa sausage, sauteed bok choy, bitter melon salad, piles of fried tripe and fried bread, and grilled green onions. You get to choose two appetizers and three entrees from a set menu. Each of my three dining companions and I received two bowls, one with vinegar and chiles and another with soy sauced-spiked mayo (recommended for the tripe). The only other thing in front of me was a San Miguel beer and a napkin, the latter of which would prove useless. It was at this point that I snapped a few quick photos because as soon as I put that iPhone down, it was time to eat. For about 30 minutes straight. No talking, just visceral moans from all the startling intersections of flavor and texture; spicy gives way to sour then sweet. Crispy melts into fatty and tender. Maw at the sticky rice with your hand, form it into a little ball and wrap a shred of pork (or chicken, fish or sausage) around it, dip it into the vinegar, pulling up a chile as you bring it all to your mouth. Repeat until nearing food coma, save some room for the icy dessert halo halo and then prepare to not want anything to do with food until dinner the next day. I’m not used to this kind of gustatory defeat but according to Jeepney co-owner and sometimes-server Noel Cruz, his family feasted like this every night back in the Philippines. I think I know where I’m taking my next vacation.